Ladies and gentlemen, March Madness is upon us! And New Jersey sports betting is legal. The best NJ online and mobile sportsbooks are ready and waiting to get you into the NCAA Tournament action. But first, we at PlayNJ have decided to compare a few of these NJ mobile sportsbooks as we march into the thick of March Madness betting. We compared the various March Madness promotions, bonuses and betting odds on the apps. Then, we looked at the software, how easy the apps are to use, and the available deposit options. Here we compare the top-seeded DraftKings Sportsbook versus upstart PointsBet. DraftKings Sportsbook has taken the lead on March Madness bracket pools in 2019. It launched its DraftKings Brackets product ahead of the tournament. This allows users to enter the public March Madness bracket contests and create private competitions. Plus, DraftKings Sportsbook offered a free-to-play bracket contest, with up to $64,000 in prizes, open to anyone in the US. The best bracket here will win $5,000, and the top 6,475 finishers will all walk away with something. In the meantime, players in New Jersey could also buy their way into a $100,000 guaranteed bracket contest for just $20. DraftKings Sportsbook is paying the top 1,195 finishers here. The best bracket will win a $20,000 first prize. Additional contests will also be available allowing players to join in later rounds. DraftKings posts relatively competitive lines, but the only issue is that you might find a better price elsewhere. For example, NJ sportsbooks posted point spread lines for March Madness games first. While a West Region game like (No. 8) Syracuse vs. (No. 9) Baylor opened at Syracuse -1.5 (-112) on DraftKings, it opened at Syracuse -2 (-105) on PointsBet. DraftKings Sportsbook has maintained one of the best new player bonus structures in the NJ online sports betting market from the word go. 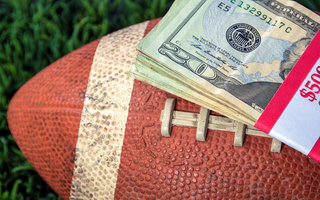 New users get $25 in free bets just for signing up at DraftKings. This is five $5 bets for free. Plus, your first deposit is also matched up to $500. Easy peasy. The DraftKings Sportsbook app is as quick and responsive as any on the market. However, it’s the user-friendly nature of its software that gives it an edge over the competition. The software employs its sports betting language that’s easier to follow than traditional sports betting jargon. This innovative approach to sports betting appeals to a wider audience and puts DraftKings Sportsbook software in a class of its own. There’s no question that DraftKings Sportsbook is easy to use. By inventing its own sports betting language, DraftKings Sportsbook has made betting easy for novices and advanced users alike. DraftKings Sportsbook only has a limited number of deposit options, which may be the sports betting app’s only downfall. PayPal is there, and so is a claim that the site accepts credit and debit card transactions. However, the latter depends entirely on the bank that issued your card. You can also move money from a linked daily fantasy sports account to DraftKings Sportsbook, giving you at least one more option. You won’t find a free-to-play March Madness bracket challenge or the chance to create your own brackets pool on PointsBet. However, the site is hardly ignoring the NCAA Tournament from a promotional standpoint. In fact, PointsBet has a variety of March Madness promotions available, including its PointsBet Bracket Challenge. This contest involves betting moneylines on March Madness games. There’s a $5,000 Bonus Bet available to the player that picks the most winners in all March Madness games. A minimum $10 moneyline must be placed on each game for it to count. Players earn a point for picking favorites that win and two for underdogs. Whichever player has the most points after the NCAA Tournament wraps up, wins the $5,000 Bonus Bet. Additional NCAA Tournament promos on PointsBet include the Make It Rain 3-Point Payout promotion being extended to all March Madness games. Here, players that place spreadline bets receive a $3 Bonus Bet for every 3-pointer the team they bet on hits. A minimum bet of $100 is required. Plus, PointsBet’s March Madness Cinderella Heartbreak pays out bonus bets, up to $100, if you book a moneyline bet on any team seeded 10 through 16 playing a higher seed if they lose by 3 points or less. The early lines for March Madness games at NJ sportsbooks were all point spreads. Since the price on point spread bets at PointsBet is -105, it has positioned itself as one of the best places to bet March Madness point spreads in the NJ sportsbook market. The app posts similar lines to most NJ sportsbooks, but its competitive pricing gives it the edge over the others. PointsBet will give anyone that signs up for a new account, using the promo code PLAY50, a $50 free bet. Plus, make a deposit and PointsBet will give you up to two $500 free bets. That’s $1,050 in free bets and just about as much as you’ll get from any sportsbook in the NJ market. PointsBet software is solid. While the innovations come more on the promotional side here, the software is as good as any standard sportsbook offering on the market. It’s easy to navigate our way around the various betting markets, and betting is just a click away on PointsBet. No complaints. PointsBet offers only a limited number of deposit options. It’s strictly bank ACH/e-check, Visa or Mastercard, or a PointsBet card linking back to a credit card. PointsBet puts up a good fight here with its March Madness promos and massive new player bonus structure. Plus, its pricing is among the best in the business. However, the availability of public and private bracket contests, a free-to-play contest with more than $60,000 up for grabs, and DraftKings Sportsbook innovative approach to the language of sports betting sets it apart from all challengers. DraftKings Sportsbook is a one seed in the NJ online sports betting market. It ticks all the boxes and is a tough one to beat.